Trinity is set in the centre of Porthcawl on the corner of the two main streets and the beginning of the pedestrianised area of John Street. It is within walking distance of the sea front and there is a large carpark nearby and plenty of street parking with disabled places. Porthcawl is a seaside town within 3 miles of junction 37 of the M4 corridor and half an hour's drive from Swansea and Cardiff. The population is approximately 17,000 and there are many commuters living here. There is also a high percentage of retired people and some residential homes in the area. We have good primary schools and an excellent local comprehensive school. 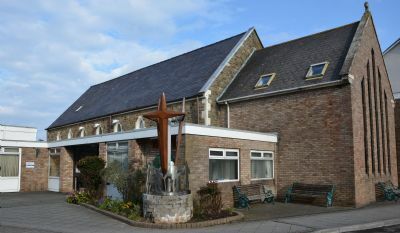 Many people would regard Trinity as the community church both for its location and for the wide variety of community activities that are held here. Trinity is a vibrant modern church which was formed in 1984 when the local Methodist (Wesley) and United Reformed Church (Highfield) joined together. The building has been altered and extended to accommodate the very active social outreach work of the church. The sanctuary can seat up to 300 people and there are 9 rooms /halls which are in continual use throughout the day and evening. They are used by many outside organisations as well as church groups and are available for hire by contacting the church office. There are excellent kitchen and toilet facilities available for all the groups as well as modern computer/media and printing equipment. The church office deals with day to day administration and the minister can be contacted outside of the office hours. On average 2000 people use the building weekly and it is very much in the centre of community life here in Porthcawl. As well as Sunday services, we hold many events throughout the week and the church hall is used for groups run by Trinity members as well as leased by other groups. Information about 'what's on' during the week is also advertised in the Seaside news and displayed on notice boards in the church foyer and throughout the town.